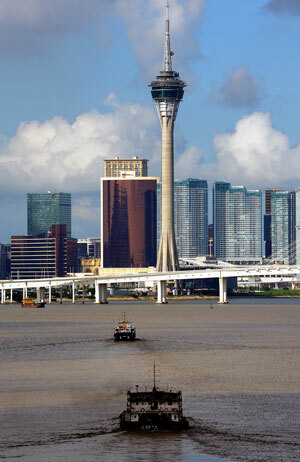 Macau, located on the southeast coast of China, is a special administrative region of the country. Being Asia's well-known gambling Mecca, Macau is a place to find the traditional Chinese culture while enjoying the exotic Portuguese buildings. The name of Macau is derived from the word Magao (A-Ma Temple), which was the shrine dedicated to Mazu, a sacred sea goddess respected by Macau people. It was said that in the middle of sixteenth century when the Portuguese first set foot there, one of the officers asked a fisherman the name of the land. The man misunderstanding the officer's meaning, answered 'Magao' - the name of A-Ma Temple in front them. The word became the Portuguese name for the land and for nearly 400 years, the Portuguese ruled here prior to Macau's official return to the People's Republic of China on December 20, 1999 as a special administrative region. The land of Macau when compared with other Chinese metropolises unlike Beijing, Shanghai or Guangzhou is quite small covering an area of just 27.5 square kilometers. 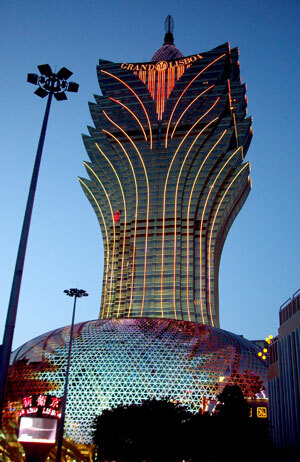 The total population Macau is 469,800 of which 95% are Chinese, the remainder being Portuguese and other westerners. The majority resides on the Macau Peninsular where you can find a variety of both Oriental and Western cultural and historical places of interest and all sorts of old buildings that are either European baroque or traditional Chinese in style. The blend of people, culture and history has influences on every aspect of life in the city. A wander around the Macau Peninsular will bring you into a world of antiques and fashion, traditional and modern, as well as tranquility and glitz. Most travelers who have been to Macau conclude that it is a location suited to both tourism and living as it is a beautiful city with clean streets, gardens and picturesque hilly landscapes. Sunshine, clear air, green lands and all sorts of delicious food all contribute to its many attractions. Wandering around is the best way to explore the city's numerous historical and cultural heritages. 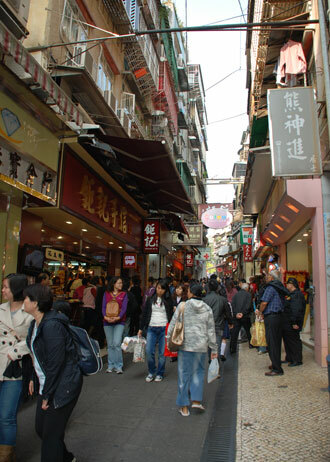 Popular sightseeing places that form part of a traveler's itinerary are spread all over the Macau Peninsular. Largo do Senado, the splendid main square with surrounding simple, elegant Portuguese and baroque style buildings is the busiest downtown area of the city. Clothing shops, curio markets, pharmacies, snack stalls and jewelry shops housed in the narrow alleyways that radiate from the square sell dazzling items. 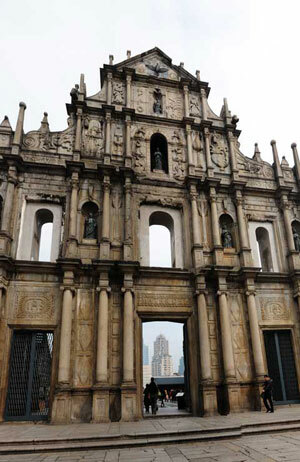 A northerly walk leads tourists to the featured attractions of the city Ruins of St. Paul's, a former screen wall of St. Paul's Church and the Monte Fort, one of the best-preserved forts in Macau. The Museum of Macau, to the right of the ruins, tells all stories on the city's past. Situated at the base of Penha Peninsula in the southwest part of the city is A-Ma Temple, built in the Ming Dynasty (1368 - 1644), which is dedicated to the sacred goddess A-Ma. During the festival seasons, thousands of devout prayers come to visit the temple. In the southern part of the Peninsular, the New Reclaimed Area and the Outer Harbor Area, compared with the more traditional central and western areas, is the newly-developed region on which the modern aspect of the city can be found. There are many luxurious hotels housing various gambling casinos and these venues are packed with people from all over the world when the night comes. Numerous museums in these two areas present the essence of Macau's culture and history including Macau Wine Museum, Grand Prix Museum，Macau Art Museum, etc. The two outlying islands of Taipa and Coloane, connected to the Macau Peninsular by two bridges feature tranquil natural and beach sceneries and are good choice for a short break away from the bustling Macau Peninsular. Macau Jockey Club's horse racing attracts numerous gamblers from the nearby areas and Hac Sa Bay and Bamboo Bay are two breathtaking natural scenic areas with the best seaside bathing places in Macau. Macau is the paradise for gourmands with a wide range of delicious cuisines from all over the world including unparalleled Macau-style Portuguese cuisine, traditional Cantonese cuisine, exotic food from Italy, France, Brazil, India, Japan, and Korea... Everyone can find his own favorite! Moreover, the well-known Macau dim sum delicacies should never be missed. The Pastéis de Nata (a Portuguese-style egg tart) that originated on the outlying island of Coloane is the featured snack of the city and Margaret's Café & Nata offer the best. All kinds of dim sum ranging from almond cake, chicken cakes, cashew cookies, sesame crackers, egg and cheese rolls are served in the many Portuguese café and they are good choices for gifts of families or friends. Known as 'Oriental Las Vegas', the gambling industry in Macau is booming and has already become an important feature of Macau's economy. Surprisingly, tourists do not find the kind of razzmatazz in Macau's casinos as elsewhere; by contrast you can feel the expectations of gamblers from their polite manners and the peaceful atmosphere.